I’ve been wanting to read this book since I first found out it had been written, which was quite some time ago. I had been meaning to borrow it from my employer’s library, but never got around to it. Then I saw it in my sister’s old bedroom1 on her bookshelf. I borrowed it and read it in two days. You might be wondering “who is Louis Riel” and why should I care about him. So let’s get some facts. Louis Riel was a Métis, educated in Montréal, who returned to his home, the Red River settlement in what was then known as Rupert’s Land. The Métis are part-French, part-First Nations. Red River settlement is now known as Winnipeg. Rupert’s Land was owned by fur traders, the Hudson’s Bay Company, which is now a department store known as The Bay, or HBC. Rupert’s Land consisted of much of what is now The Northwest Territories, Nunavut, Ontario, Quebec, Manitoba, Saskatchewan, and Alberta. A hero to the French, and villain to the English. Led two rebellions against the Government of Canada. Elected twice to the House of Commons, never sat. Was exiled from Canada, and lived in the United States. Believed the Métis to be the thirteenth tribe of Israel. Tried, convicted, and hanged for treason. His life is taught in every grade eight classroom from coast to coast. The only exciting part of Canadian history. Was ranked the 11th greatest Canadian by the CBC’s Greatest Canadian program. In 1870, the young Canadian government, headed by Sir John A. Macdonald purchased the land from the Hudson’s Bay Company. Their plans were to eventually give that area proper representation, but a fear of a double threat from the French2 led Macdonald to hold off on bringing democracy to what would be Manitoba, until Eastern Anglos could move out west and bring along the loyalty to the crown. And that was the tip iceberg. The Métis weren’t opposed to joining Canada, they just wanted their say, and proper representation in Canada. This led to a rebellion, and the Métis were given their demands, the Manitoba Act was passed3, and the provisional government (headed by Riel) were given amnesty, except for Riel, who had a lynch mob after him. Riel fled to the United States. Once he returned to Canada, Riel ran for a seat in the Commons, and won it easily. With a price on his head, he was never able to take his seat in Parliament. Métis, Cree, and Blackfoot, living in what is now Saskatchewan were starving, as the Buffalo were falling extinct. These First Nations were learning agriculture and finding themselves in the same land claim problems the Manitoban Métis had a few years earlier. They asked for assistance from Riel. Long story not much longer, they rebelled, many died, they got much of what they wanted, the government got what they wanted (Riel). 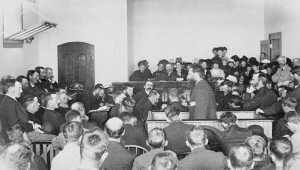 Riel was then tried, convicted, and hanged for High Treason. So what does that all have to do with a comic book? Well Louis Riel is the story of Riel’s life as told in the form of a comic strip. First off, we know that Brown has a limited audience because only Canadian would be interested in this story which is a unique story among all of Canadian history. More importantly, though Riel’s story is exciting and filled with bloodshed, it’s also boring and technical, with details about the seigneurial system, French/English bickering, and Macdonald’s political aspirations. 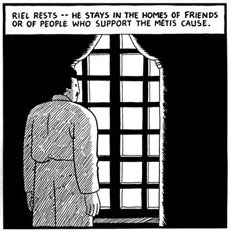 Riel’s story is not an easy one to study, but I think Chester Brown’s book would be a great help from young students learning about this important part of Canadian history. More so, Louis Riel is a great graphic novel. If we ignore the simple fact of its historical context, and just focus on it as a story, it’s captivating, entertaining, and extremely enjoyable. 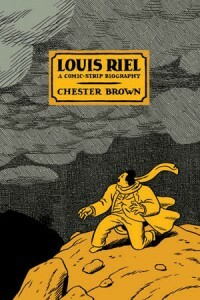 Chester Brown’s art is simple, but it provides a great visual which helps narrate Riel’s story. I’d recommend this book to anyone, Canadian or foreign who wants to read an interesting story about racism, fighting for freedom, and mental health. I too enjoyed Chester Brown’s work. It did about as much as a comic book could do. I do disagree with your reference to Riel’s insanity. Religiously neurotic, maybe, but he was no more insane than you could expect your average patriot/prophet to be. He died in 1885 and predicted it would take 100 years for the Métis to take their rightful place in Canada. In 1982 that happened with the their inclusion in the Canadian constitution. He suggested Assiniboia should be divided roughly into sevenths for the seven ethnic groups he expected would live there. The 1,400,000 acres set aside for the Métis in the Manitoba Act of 1870 was 1/7th the size of the original province of Manitoba. The most insane prophecy of them all — that the United States would replace Great Britain as the world’s dominant power was clearly nuts at the time —- but ???? Of course he also expected the Holy See (Pope) to move to North America — but three out of four ain’t all that crazy. Mildly interesting fact: I went to Batoche on a field trip in Grade 5. I’d also note that the story isn’t only of interest to Canadians — people around the world love the stories of repressed nations, struggling to be free. Plus there’s a lot of people who harbour romantic notions about the whole thing. Also also: this post made me think of this song (http://www.youtube.com/watch?v=F5or31cJN4I). Which is cool.